Gov. Cuomo has proposed a licensing regime for student-loan servicing firms for several years. This year, a Democratic Senate that could pass a bill that was revised in line with a recent court decision. New York City owes $34.8 billion in student loans, a burden born across neighborhoods and demographic groups, but not born equally. Blacks are more likely to owe educational debt than whites, according to research by the New York City Department of Consumer Affairs. Women are more likely to feel the squeeze of student-loan IOUs than men. Older debtors are more likely to fall behind in paying off their loans than their younger counterparts. With one in seven New York City residents owing money on student loans and the delinquency rate statewide a third higher in 2015 than a decade earlier, there’s growing alarm at the impact student loan debt could have on communities least able to absorb it. There is also mounting concern that the private firms servicing that debt are only adding to borrowers’ troubles. The U.S. Department of Education’s inspector general found earlier this month that debt-service companies regularly run afoul of rules but rarely face any sanction from federal supervisors. There’s little hope that the feds will change their pro-lender approach on education finance: Education Secretary Betsy deVos has scaled back U.S. regulations and tried to stop states from filling the gap. In Albany, however, Gov. 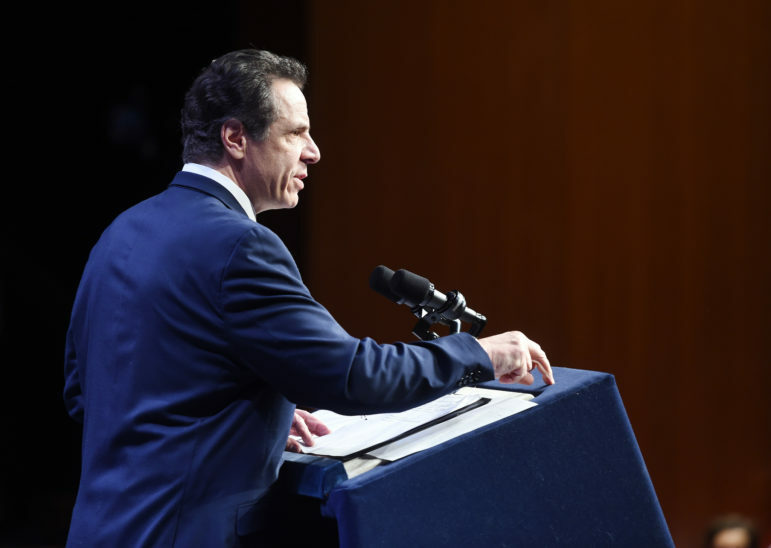 Cuomo and his Democratic allies in the legislature could soon give New York State the power to crack down on student-debt servicers. This is not the first time the governor has proposed a state licensing scheme for student-debt servicing firms. Last year, legislation mirroring Cuomo’s proposal by Assemblyman Kenneth Zebrowski and State Senator Kevin Thomas passed the Assembly but was blocked in the Republican-controlled Senate. This year, the political landscape is vastly different. But the legal landscape has also changed. Last fall, a U.S. District Court decision threw out much of the District of Columbia’s new regulations on student-loan servicers because they applied to loans owned by the federal government, which the court said represented a preemption of Congressional authority. With that decision in mind, Cuomo’s current proposal would not require licensing of servicers that only work with federally owned loans. Firms that service private student loans would have to get a license. According to DFS, the proposal would give the agency the power to impose $10,000 fines on those lenders if they violate new regulations that are part of the proposal, including requirements for how servicers handle “nonconforming payments,” how quickly they must respond to inquiries from borrowers and the information they share with credit-rating agencies. The proposal also bans upfront fees. The majority of student loans nationwide are owned by the federal government and serviced by companies under contract. But hundreds of billions of dollars of loans are not owned by the feds; they were originated by the federal government but are now owned commercially, or they were private loans to begin with. New York would join California, Connecticut, the District of Columbia, Illinois and Washington in creating a state licensing system. The Student Loan Servicing Alliance, a servicers’ trade group, did not respond to a request for comment on the New York proposal. While advocates are excited about the law, they’re quick to note that licensing servicers will not solve the student-debt problem on its own. While the law could improve communication between servicers and borrowers, it doesn’t ensure that borrowers are getting the best advice on how to reduce their loan exposure. CSS (a funder of City Limits) has proposed the creation of a Student Loan Consumer Assistance Program that would use community-based organizations to provide information, assistance and even legal advice to people struggling with student debt. Some have called for even more aggressive action. Ron Kim, a Queens Assemblyman running in Tuesday’s special election for public advocate, has said New York’s leaders should petition private student-loan holders to forgive hefty debts or should purchase the debt themselves, so they can write it down. Barring that, Kim has called for using eminent domain to seize outstanding loans—a controversial and largely untested strategy for a government taking that treats financial assets like real property. Proponents of the more measured steps proposed by Cuomo and CSS note that there are already programs for loan forgiveness. While imperfect, those programs could help overburdened borrowers if they knew about them. By requiring better communication by servicers and creating new resources for borrowers, as the licensing law and the consumer assistance program would do, the hope is that more consumers would find their way to the help they need. There are deeper issues at play, of course. The rapid rise in the costs of college and the slow growth in wages put families and students in a squeeze that makes onerous student-loan debt more likely. According to the Office of the State Comptroller, from 2005 to 2015, the cost of college for in-state students at public institutions in New York rose by nearly 55 percent. Private school costs rose nearly as fast. In a study last year, the Federal Reserve Bank of New York found that student loan delinquency was especially prominent in the Bronx, where 19 percent of loans are delinquent and median loan balances are equal to 43 percent of median income. Because only a regular election deserves a full Top Ten list.